A huge part of Choir etiquette is good personal hygiene. It's a very delicate issue to deal with in group dynamics. 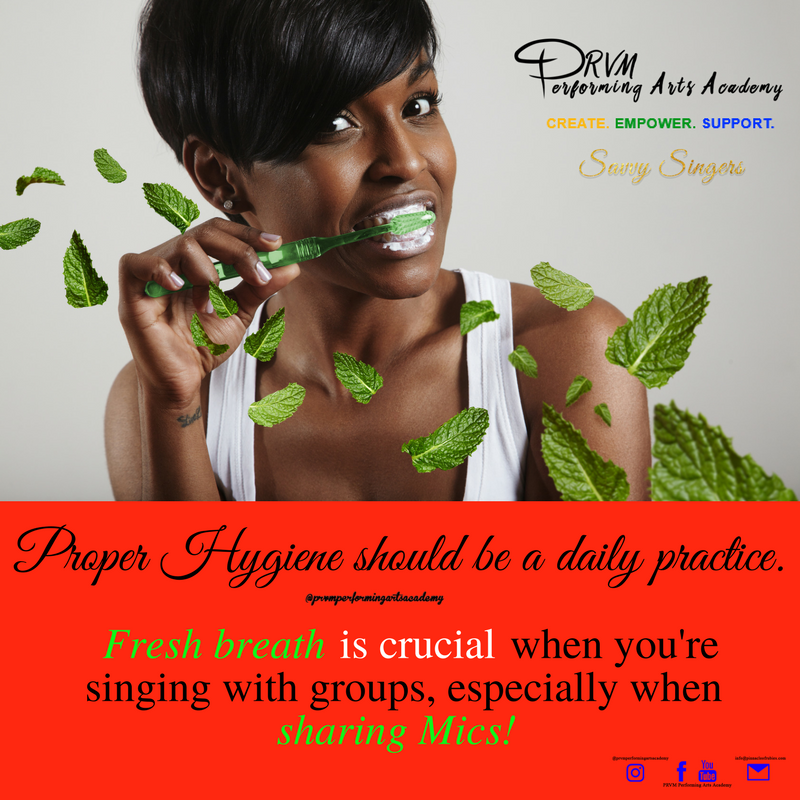 With much care; I highlight the impact of poor hygiene within vocal groups. So let's chat about the topic most choir directors dread, members dance around or gossip about. Have you ever used the same microphone after another singer and you could not stand the stench emanating from the microphone? Maybe, you have been in a position where you had to share a Mic with others, and the foul smell from their mouth was just unbearable!? How about having to get up close and tight with members during your song but they have wet or smelly armpits and a horrible body odor? Over the past 12 years as a choir Director, I've witnessed many facial expressions and body language depicting struggles some singers face while sharing Mics. The dread on their faces and awkward body language of avoidance when getting near other singers who have offensive odors, whether it is stinky perspiration, smelly hair or bad breath! All members should seek to ensure they practice good personal hygiene. However, keep in mind, some people have certain conditions, others are not aware they have an offensive scent. You never know the reason, that's why dealing with these issues require love, care, and tact! You can be an amazingly skilled, dynamic, charismatic singer, but if you have bad breath or body odor, you're making other members uncomfortable, and this will affect how they interact with you. Members will not want to share a Mic or directly interact with you! Many will simply avoid you! Have you had the misfortune of experiencing bad breath, smelly hair, suffocating fragrances and then there's my personal pet peeve, wet, smelly armpits!? If you haven't, count yourself fortunate! Trust me I know that feels, and it is not pleasant at all. "Poor Hygiene is highly offensive to choir members!" I want to admonish members of vocal groups, please take personal responsibility for how you smell, because nobody wants to have to address this issue for fear of embarrassing or hurting a colleague's feelings... Remember it's a team, and no one wants to negatively affect the confidence of another, upset or hurt their peers. On the other hand, these issues do negatively affect the team: members begin to gossip, some take strong offensive because they feel their comfort is not being taken into consideration or respected by the individual. I have come in direct contact with some people who left me wondering if something died in their mouths, that’s how bad it was! There have been instances I’ve had to excuse myself from conversations because the individual's perspiration was so high, I felt nauseous! Scrub your tongue. Build up on your tongue causes bad breath. Rinsing with mouth wash is helpful! Gargle Organic coconut oil, its quite effective. Carry breath spray or keep mints should you need one! If you have bleeding gums, visit the dentist. 2. Have a bath before attending rehearsals. If you're coming straight from being out all day and can't have a bath then opt to refresh yourself with disposable wipes. Use mild scented spritz and creams. Avoid high scented fragrances this can irritate other members with regards to respiratory issues and sinus allergies. 4. Lovely ladies, Wash your hair. Keep it clean and pleasant smelling. 5. Keep your socks and shoes clean. Use clean socks and shoes. Some people naturally have sweaty feet. Invest in a foot spray or powder, these normally help. Odors are offensive, poor hygiene repulsive! Don't lose respect or allow issues with quick, easy fixes to disrupt the effectiveness of the team and cause you to be talked about because you are perceived as insensitive. Always think about what you can do to enhance the efficient and effective functioning of the team. Have caring consideration for other choir members. Remember bad odor is no reason to ridicule, make fun of, gossip or embarrass anyone. I hope this blog has helped to bring about awareness as to how significantly groups are impacted by poor hygiene. For more guidance, natural remedies, and recommendations Click Here to book a one one coaching session with me.